Last week, Avatar faced its first competition for the top spot at the box office since Christmas. Although The Book of Eli took its best shot, it was well short. The collection of stiffs this weekend are even less of a challenge for Avatar to overcome. For the second straight week, we have an action star embarrassing himself in a head-scratching concept for a kids movie. Compared to The Spy Next Door, Tooth Fairy steps up both the fame of the star and the embarrassment of the concept. 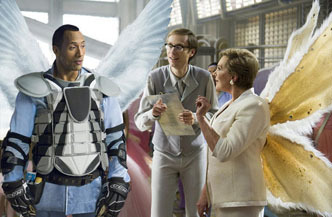 Dwayne Johnson stars as a crass and jerkish minor-league hockey player who after a shocking incident of insensitivity is sentenced to a week as an actual Tooth Fairy (see, because hockey players often lose teeth, and ... oh, kill me). Oh yeah, they're real in this world and are led by Julie Andrews, who's a long ways from Mary Poppins here. As horrible as this looks to right-thinking adults, kids seem to eat this kind of crap up (see: The Pacifier, The Game Plan, Daddy Day Care), although Tooth Fairy doesn't have the muscle of Disney behind it, which launched The Gameplan to $22 million and Race to Witch Mountain to $24 million. Still, enough dumb kids (and I am talking about the really dumb ones here) just want to see The Rock acting silly that this won't be an outright flop and might even do marginally well. For some reason, the population that wants to see Dwayne Rock in a tutu is a positive number. Opening at 3,344 venues, Tooth Fairy should manage about $16 million this weekend. Continuing the theme of repeating last week's films, Legion follows The Book of Eli's post-apocalyptic world with an actual apocalypse. See, it seems God's had enough of us, and is sending his angels to wipe humanity off the face of the Earth. One rogue angel (Paul Bettany) has come down to protect us, or rather specifically, one woman's (Adrienne Palicki) baby, who may just turn out to be a new Savior. How's he going to do that? With a crapload of guns, of course.